Many movies are remembered for certain aspects of their filming. Some remember Star Wars for its groundbreaking special effects; some remember the Star Trek movies (new and old) for their ship-to-ship battles; others enjoy Pacific Rim or Avatar because of the CGI, etcetera, etcetera. There are times I am hardly aware of the scenery in a film or book because I have become engrossed with the characters. I notice this more when I am reading than when I am viewing a movie, but the effect can occur with either medium. When the characters are interacting with each other, everything else becomes extraneous. They are the important part of the story. The setting? That’s window dressing. It could happen on the head of a pin and I would not notice the difference. This brings me to the movie I wanted to talk about today, the 2009 film Push. 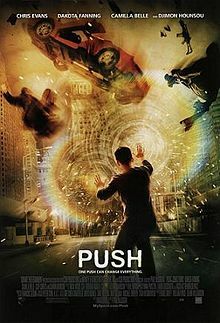 Push is a rather long film about people born with extraordinary powers. These powers include: telekinesis; clairvoyance (the ability to see the future); sonic screams; the ability to wipe another’s memory; psychometry (learning the history of an object by touch); the ability to ‘psychically’ heal an injured person; the ability to mask people or places from psychometrics; the ability to change an object’s appearance, and the ability to manipulate other peoples’ memories, thoughts, or emotions. According to the film, people with these powers were noticed only near the end of World War II when the Nazis began experimenting on them. Of course, the Nazis were defeated before these tests got very far. But that did not stop other governments from continuing such research. These experiments were designed to artificially enhance the powers which these people possessed, but there was a snag. No one ever survived the procedures. Then one young woman, a ‘Pusher,’ does survive the procedure. And she escapes with a syringe full of the latest power-upgrading juice her tormentors have developed. This officially leads us to the film’s protagonist, Nick Grant (played by Chris Evans). Nick is a ‘Mover’ – a telekinetic – living in Hong Kong to avoid the people from the Division (the group which captures and experiments on these special people). Nick makes his money gambling, using his telekinesis to influence the outcome in his favor (though this does not always work). Since his father died defending him from the Division, Nick seems to have been avoiding using his powers for more than betting games. Lack of practice beyond this means his powers are not fully developed and he is ill equipped to deal with circumstances other than gambling. But Nick’s life of scraping by is soon turned upside down when a young girl of about thirteen, named Cassie Holmes, ‘drops’ by his apartment. She tells him she is a ‘Watcher’ – a clairvoyant who can see the future, although not in absolute detail. Cassie tells him that they have to find a suitcase which carries something that can bring down the Division. At first Nick wants nothing to do with this plan. This is no surprise, as much for Cassie as for the viewer. At the beginning of the film one is left with the impression that Nick does not like his powers and wants nothing other than to continue existing rather than living. Of course, this gets turned around fairly quickly and Nick begins helping Cassie. Cassie and Nick soon become friends, in part due to their similar pasts. Nick’s father died while buying his son time to escape the Division. Cassie’s mother, the most powerful Watcher the Division has ever encountered, is still in Division custody. It is later revealed that Cassie’s mother is so powerful she was able to predict the events of Push years in advance. Despite severe drugging, it is also hinted that her clairvoyant abilities remain strong. Eventually, Nick and Cassie do find the suitcase – along with the escaped Pusher, Kira, who is also an old girlfriend of Nick’s. 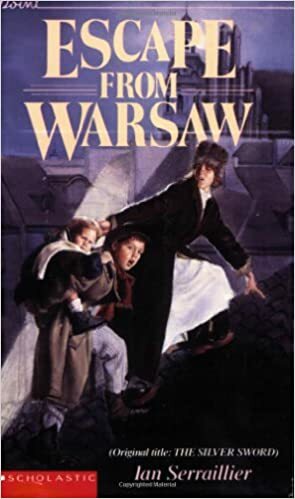 The movie is very long (I had a bad cold when I first saw it, so I did not care too much about its length) and has a cliffhanger ending. The details of the movie emerge slowly as the film progresses. Not surprisingly, Push was not a big splash at the box office. So what made me like it? Mainly, the interaction between Nick and Cassie. The scene which encapsulates why I enjoy the film is near the end of the movie: Cassie, overcome with fear at the danger she still sees in their future, asks Nick to tell her she is wrong about them losing their battle for the case and that she is just a very bad artist (when she predicts the future, Cassie draws the images she sees). By this point, Nick cares a lot about Cassie. Not only does he gently tell her they are going to get through okay, he gives her a hug, showing just how much the two of them have come to care about each other in the course of the film. I think they could have shot this scene in a blank room and I would have liked it all the same. This scene sealed the deal for me; I liked Push. Fighting action does not leave the impression on me that character interaction does. And no, I am not going to spoil the ending of Push! Also, I have to say that Push is one of Chris Evans’ best films. As the Human Torch in the Fantastic Four movies, he drives me crazy. When he is playing Captain America, I think he is the greatest thing since sliced bread. So far, Push is the only film where I have seen him interact with a child star for more than five minutes, and he does it well. By all accounts, this is the mark of a talented actor; when they can make you like them or hate them, then they are doing their job right. Hollywood has a reputation today that implies such relationships between adult stars and child stars have become a rare thing. To watch Evans interact the way he did with Dakota Fanning (Cassie) made a good movie even better for me, because they actually appeared friendly with each other. This is one of the things I am hoping Marvel will get around to doing with all its film characters. In the comics, Marvel heroes have occasionally had to play guardian to a child from time to time, or they have had to rely on a youngster to help them out. The results in the comics vary from good to downright outstanding. On film, however, the process has been rockier. For example, the writer for Iron Man 3 tried to have Tony and a ten year-old boy befriend each other in that film. But there was little friendliness between the two for most of the movie; they spent many of their scenes together annoying each other, which is not how I think any version of Iron Man would behave with a ten year-old. Nor would most ten year-olds be trying to nag or annoy their favorite superhero. Behind the scenes the two actors may have gotten along better, but in the film their ‘friendship’ was pretty near pathetic. It would be great to see Marvel actually attempt to have the heroes in their films befriend a child or two during a movie, especially one of the Captain America films. Evans’ has proved capable of doing it via Push, and it would add another dimension to Cap’s character, I think. The fun that writers could have with reticent characters such as Black Widow and Hawkeye, or magnificent characters such as Thor, playing babysitter or older sibling to a child is literally limitless. Cap can handle most situations thrown at him, even those regarding a youngster, but a character like Black Widow would probably feel a bit out of her depth dealing with a nine or ten year-old child. And watching Thor, who can be rather heavy-handed with, well, almost everything, back off a bit around a child would be interesting. Hemsworth is a dad; I would be curious to see how that affected any on-screen performances he may take part in with children in the future. Of course, between the two of them, Marvel and Hollywood could ruin such an idea. I do not lay this blame on the actors or actresses; for the most part they simply do as they are told. But those in charge of the money in Hollywood have been known to botch a free lunch. And Marvel is busy trying to please every human on the planet; doing this means that the company’s print stories have become so twisted around, writers are years unknotting them. It is a good thing Stan Lee went to work to get his characters on film, otherwise the TV shows and movies might have all flopped, the way the company has been writing. Still, I cannot help hoping that these stories will be given the old college try on film at some point. The ideas have been tested but they have yet to be fully explored by anyone just yet. And it would be nice to see other filmmakers and writers explore the adult/child interaction angle, too. Hollywood may have short-term memory loss, but I still remember great movies where kids and adults became best friends in dire situations. Miracle on 34th Street and Indiana Jones and the Temple of Doom anyone? Push proves that there are still writers out there who want to explore these relationships. I would like to see them outdo Push. But I suppose I will have to wait and see. Drat, I hate waiting. This entry was posted in Movie Reviews and tagged Chris Evans, Clairvoyants, Dakota Fanning, Experiments, Movers, Movie Reviews, Nazis, Push, Screamers, Telekinetics, The Department, Wipers on May 1, 2014 by The Mithril Guardian.